Economist's View: What’s Holding Back Small Businesses? What’s Holding Back Small Businesses?, by Catherine Rampell, Economix: The biggest single problem facing America’s small businesses isn’t taxes or overregulation. It’s low demand, according to a new report released by the National Federation of Independent Business. 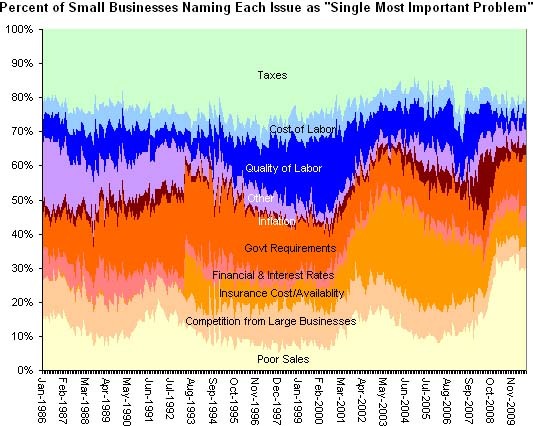 ...[A]s you can see, the portion of small businesses citing taxes as their superlative problem has remained about the same — mostly in the 17-22 percent range, say — for about a decade. Additionally,... financial and interest rate concerns are a comparably negligible concern. There's also a big change in the "insurance cost/availability" category in 2008 when these worries ease relative to the earlier 2000s (the bulge in this category seems to accord fairly well with the Bush years). That, like the rest of the evidence in the chart -- there's a very small increase in the answer on government requirements and that's about it -- is inconsistent with the charge that this administration is holding back the recovery by creating business uncertainty. It's the decline in demand that has small businesses the most concerned.